Cape Town, which lies at the foot of Table Mountain and which forms a large part of the Table Mountain National Park, was a provisioning outpost but was permanently establishment by Jan van Riebeeck on 6 April 1652. Cape Town is the second most populous city with a density of 1,700/km2 and is a mixture of industry and tourism. There were 1.5 million international tourists in 2010. The premier shopping venue, V&A Waterfront is an operating Port, allowing visitors to watch ships while dining and shopping. The V&A also features statues of South Africa's four Nobel Peace Prize winners. There are regular ferries to Robben Island and the Two Oceans Aquarium is also situated there. There are numerous examples of its architectural heritage. The National Parliament is situated in Cape Town and it hosted nine World Cup matches. It has the highest number of successful IT companies in Africa. Growing at an annual rate of 8.5% and an estimated worth of R77 billion in 2010 nationwide it is becoming increasingly important to the city's economy. 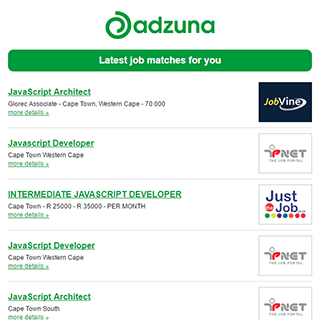 The Adzuna recency index score for this search is 1.58, suggesting that demand for job vacancies in Cape Town City Centre is increasing. Companies presently offering job vacancies in Cape Town City Centre include Media24, Woolworths, Shoprite Group..
Get the latest Jobs in Cape Town City Centre delivered straight to your inbox!